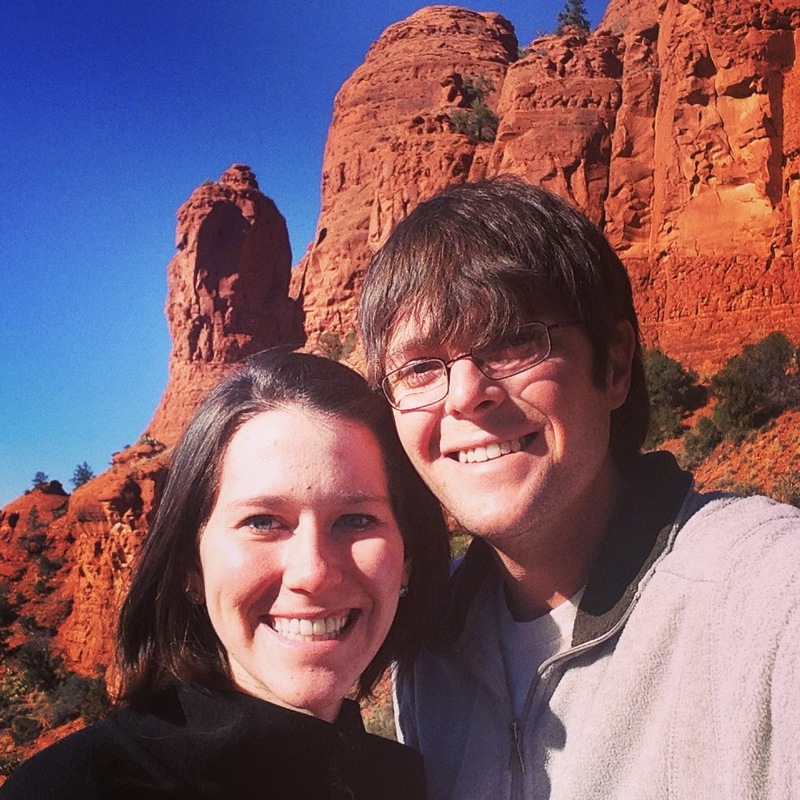 But what was the real reason for the Sedona trip (besides the gorgeous red rock of course)? FOOD – duh! 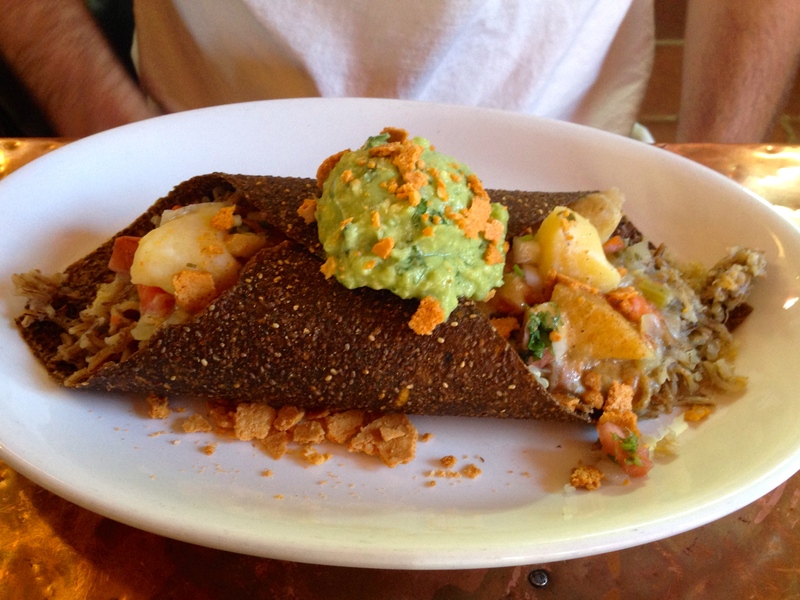 With a hippy, artsy town comes some awesome food options for me! I am completely in love with this place. It’s a hippy’s paradise but more importantly completely caters to all of my dietary needs! What a find!! Walking in, we were surrounded by dreadlocks, headbands, and jesus sandals, so of course Gabe was on board right away. David, “cooked foods chef & pillar of light,” greeted us, asking if we had been helped, and engaged in conversation right away. He was delightful, happy, and passionate. It was just a few minute wait (at 3 pm on a Monday – impressively busy!!) and then we were seated inside. All food items in the restaurant are 100% organic, local, non-gmo, gluten free, dairy free, soy free, vegetarian, and free from processed-sugar – WOW that is a mouthful of goodness (literally and figuratively)! Desserts are all raw, meaning they haven’t been cooked, which some people believe to be easier on their digestive tract, as David and I discussed. I will be looking in to how sugar and raw desserts may impact my system. The menu is full of flavor, from smoothies and juices, to waffles, banana bread, soups, salads, wraps, and veggies. I often struggle with vegetarian restaurants because I either leave not feeling fully satiated, or just lacking flavor. That is not the case here! 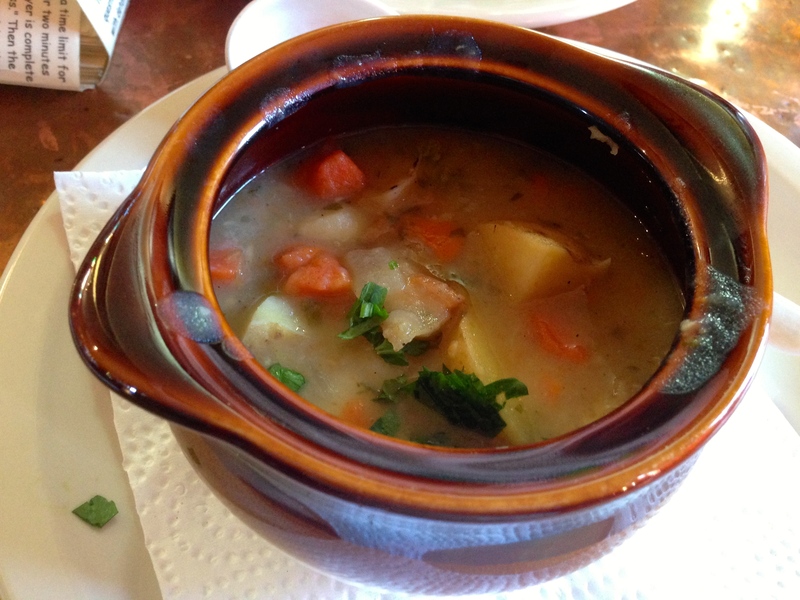 I was deciding between the morrocan magic, daily veggies with quinoa or rice, potato soup, and hummus. Obviously the waffles looked amazing as well, along with the garlic bread and Sedona 2012 wrap. It was a tough decision. 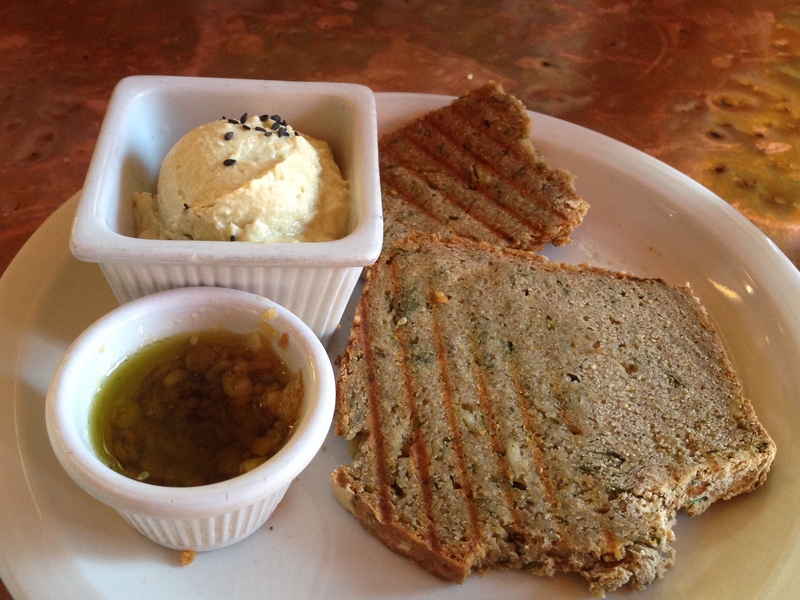 I went with the garlic lovers bread and ordered a side of hummus, since it just came with olive oil. I felt the bread was a little dry, but dip it in some olive oil and coat it in hummus and you forget what the word dry means. It really moistens up beautifully. The vegetable hummus was absolutely delicious and a must-have for every visit. My non-gf boyfriend even liked the combo so much he stole the last bite! Oh and of course couldn’t wait for me to take a picture before eating half a piece of bread. I also ordered a cup of the potato soup, to which I of course doused in salt, but found it to be very satisfying. How can you go wrong with yukon gold potatoes, really? Gabe got the most amazing wrap there – the Sedona 2012 (nicknamed the stoner’s wrap). I think this is what I would order next time, but without the vegan cheddar or guac. It’s a tomato wrap, with quinoa, rice, potato, carrot, celery, pico, onion, garlic, guac, hot sauce, cheese, and honey mustard. Yeahhhh, a lot of flavors. Every bite I could hear him moaning, so I had to try for myself and he wasn’t lying – it was amazing. At the end of the meal, David came over and we asked if they had any desserts that were purely sweetened with dates (no honey, agave, xylitol, or maple – since I avoid those). He said they only had one, but not only was it the best dessert in the house, but the best item in the whole place. It was the double chocolate ganache. Holy cow, wow. Pecan, raisins, cacao, dates, coconut, vanilla. The drizzle of chocolate over the top and on the plate is what just took me over the top. So… sweet! Gabe let me finish the last few bites of this – he knew how special it was for me. I left feeling stuffffed. The storefront is open from 9 am to 9 pm every single day – long hours!! You can order several packaged products online here, but really have to go in person to get the amazing desserts and breakfast, lunch, and dinner foods. You gotta love a place where you don’t have to remind them it needs to be gluten free, or ask about ingredients because they’re all listed. 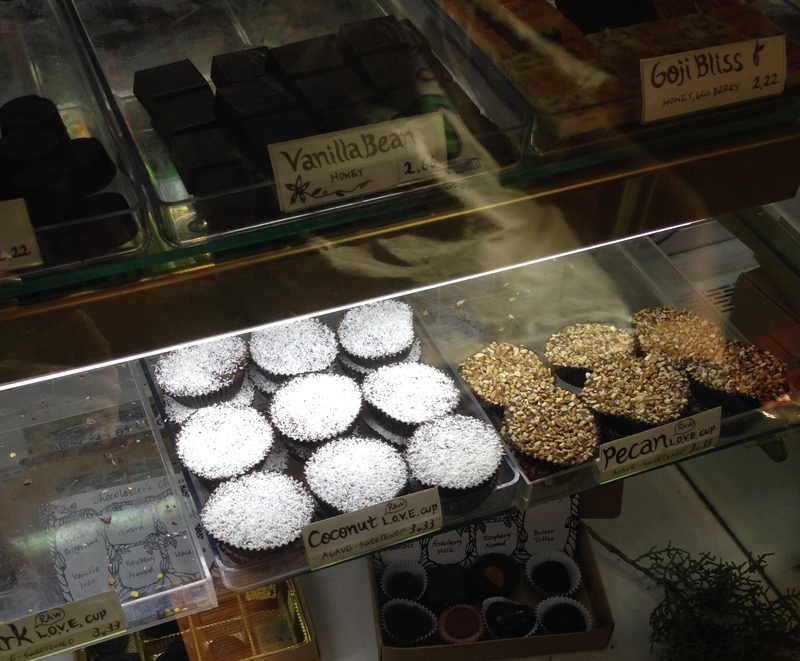 Even the chocolate case has identified which sweetener is in each of the foods, be it honey, maple syrup, agave, etc. When all is said and done, Gabe named Chocolatree one of his favorite restaurants ever, if not his absolute favorite. 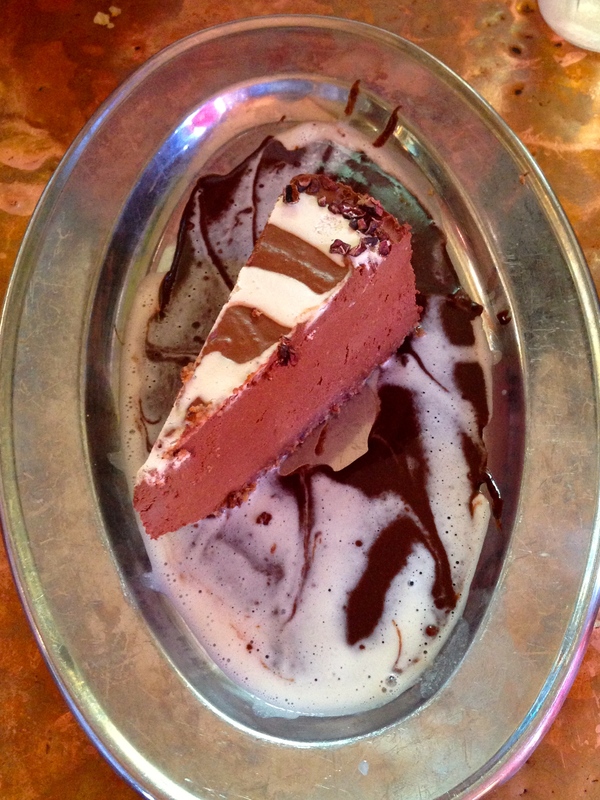 He loved the vibe, the smells of spices, and the rich flavors of both his Sedona wrap, and the exquisite dessert. Needless to say, we will be stopping back in on our next (hopefully soon!) visit to Sedona! If you’re staying overnight in Sedona, be sure to check out the plentiful gluten free (and healthy, organic, dairy free, etc.) options at this great grocery store. 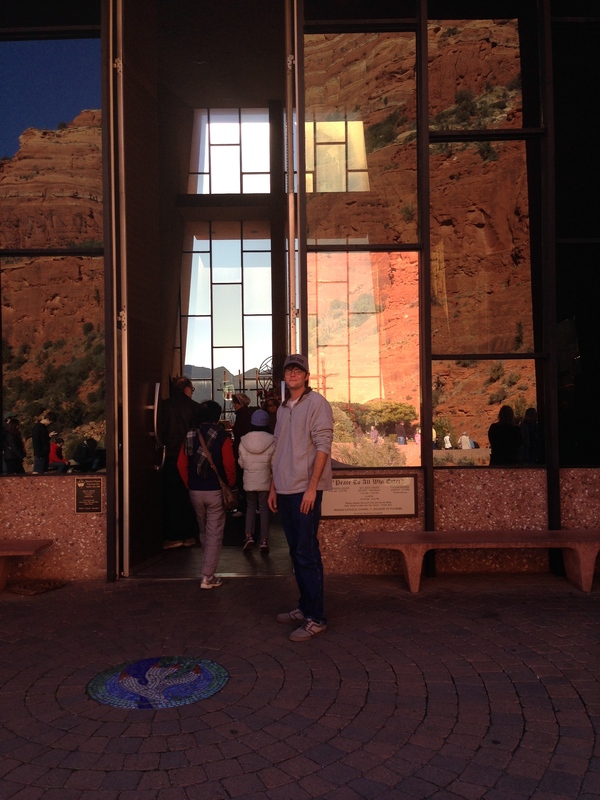 I didn’t get a chance to stay overnight in Sedona, but that didn’t stop me from dropping in! I was in search of the jovial pasta (my favorite), which I can’t find in Tucson, and sure enough, they had two different pasta shapes. What a catch! It looked like they also have cooking demos and community events there. 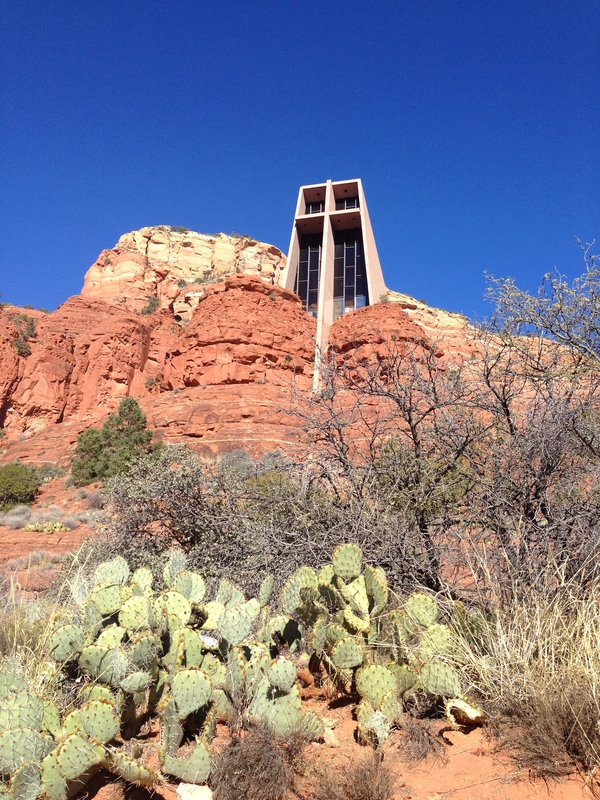 Note: I will be adding to this post as I visit Sedona in the future and dine in more restaurants and have more experiences in the area (although it may be hard to check out other spots, when Chocolatree is so amazing)! Check back!